Feedr is reinventing food in the workplace. We all know that food makes us more productive. And more productive employees make happier bosses. Some of the best and biggest brands in the world offer their employees free food. Take Google, Pinterest and Twitter for example where employees are offered a large range of food perks. But you don’t have to be a giant tech company to give your employees food perks. Take London’s very own Eve Mattress and Etsy. Eve Mattress is an e-commerce site dedicated to delivering the best possible mattress at the lowest possible cost and the least amount of hassle. Eve creates a great workplace for their employees and even has an office dog! Eve offers their employees a weekly team breakfast. This is the perfect opportunity for everyone to get together, enjoy a delicious breakfast treat and chat over a cup of coffee. Etsy, the famous peer-to-peer e-commerce site focusing on handmade or vintage items, is driven by the idea that the best work is born from diligence, craftsmanship and fun. The Etsy London office offers their employees bright, nicely decorated spaces to work and collaborate with others. They treat their team to regular team lunches for a bit of fun amongst employees. 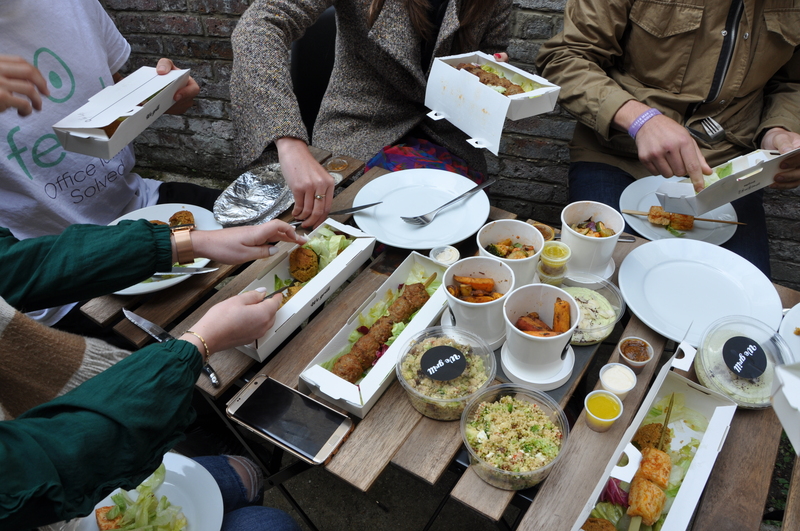 We love that food brings people together and creates a fun, productive workplace. If you are interested in reinventing your workplace and giving your employees food perks, Feedr has a number of offerings that can help. Feedr helps companies across London get delicious, healthy food into their offices for breakfasts, lunches, meetings and events. Feedr has a carefully curated set of London’s best eateries – click to browse all vendors. Feedr also has a Cloud Canteen where individual employees can buy healthier meals for themselves from a daily rotating menu from Feedr’s best vendors. Do you want to make your office more productive? Take a page from Eve & Etsy’s books and order in breakfast or lunch for your team and see productivity sky rocket. Place an order today or get in touch and we can provide some recommendations for you.